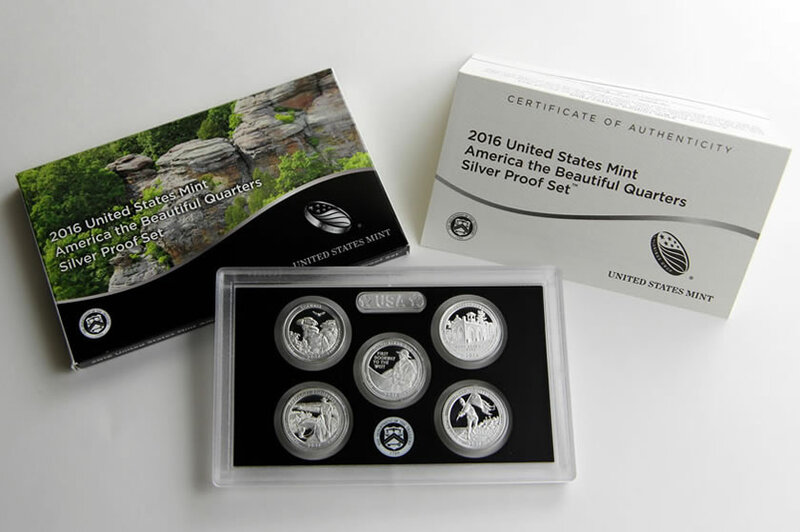 Following a one-year gap in availability, the United States Mint resumes an annual offering with the release of the 2016 Limited Edition Silver Proof Set. It goes on sale beginning today at noon (ET). Limited to 50,000 and priced at $139.95, the set has eight silver coins. Seven are in 90% silver and come from the San Francisco Mint and one is in .999 fine silver and comes from the West Point Mint. All are in collector proof quality, featuring frosted designs and mirror-like backgrounds. Six of them have designs or features unique to 2016. This includes the special American Silver Eagle with its incused "30th ANNIVERSARY" edge and the five quarters with their one-year only national park or site designs. 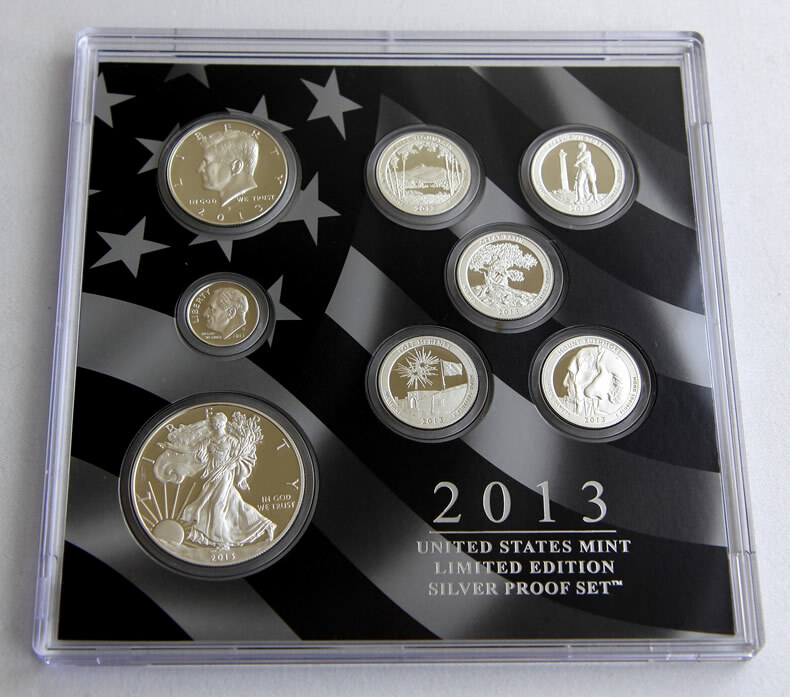 Limited Edition Silver Proof Sets debuted in 2012. Sales for that year ran at 44,952. In 2013, approximately 47,971 sold. Year 2014 saw a significant delay in the set’s release due to packaging issues but it still logged sales of 42,614. CoinNews photo of the lens of coins for the 2013 Limited Edition Silver Proof Set. Packaging issues surfaced once again in 2015. Delays pushed the set’s scheduled launch date late into the year. Then its release was cancelled after the December 2015 enactment of the FAST Act, which required anniversary lettering on all numismatic Silver Eagles sold in 2016. As described a few years ago, this set is one of the U.S. Mint’s premier products with extra attention and expense given to its packaging. But coins of the set are not exclusive to it. 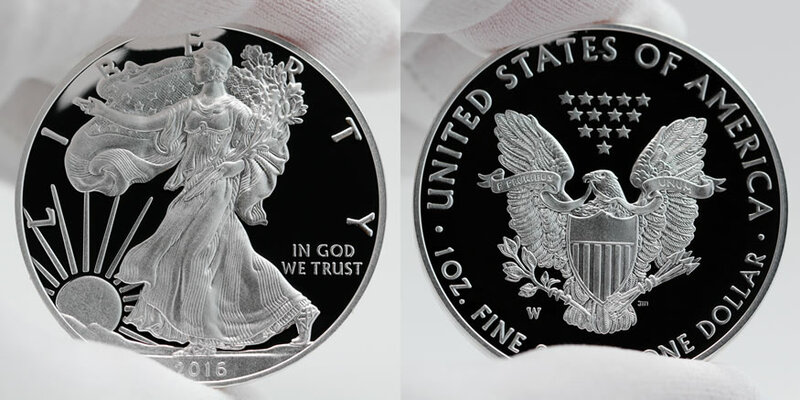 The proof Silver Eagle debuted by itself on Sept. 16 for $53.95, and it will also be within the 2016 Congratulations Set, which goes on sale Nov. 29 for $54.95. 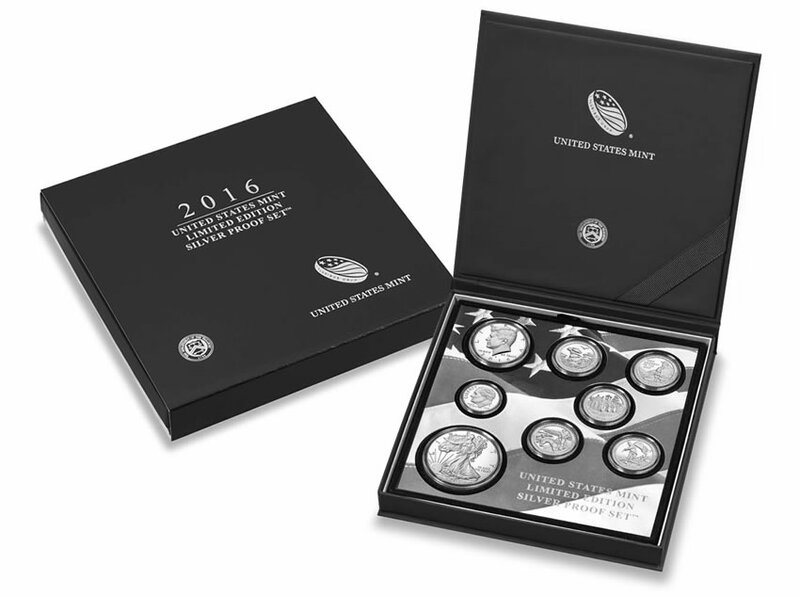 The other seven coins are included as part of the larger 2016 Silver Proof Set that was made available on April 18 for $52.95. CoinNews photo of a separately sold 2016 America the Beautiful Quarters Silver Proof Set. These same quarters are also in the 2016 Limited Edition Silver Proof Set. Also, as shown above, the same five 2016 quarters are in the 2016 America the Beautiful Quarters Silver Proof Set issued on Mar. 7 for $31.95. The set’s eight coins have a combined silver weight of 2.338 ounces troy ounces. Based on Thursday’s LBMA silver price of $16.31 per ounce, they have a melt value of about $38.13. Buy 2016 Limited Edition Silver Proof Sets directly from the United States Mint via this link to the set’s product page, or call 1-800-USA-MINT (872-6468). Are the coins in capsules? It almost looks like they are and since the Eagle has a lettered edge they might have decided to use capsules to allow the edge to be seen. Capsules would be a big plus because they would help prevent toning that the Limited Edition sets seem to have a problem with. Capsules would also be good for those wanting to keep certain coins and sell the rest. Once again is the Silver Eagle set for release in December a Burnished one? I have already gotten a BU and Proof Eagle. So why would the mint issue another uncirculated Eagle when ir already has? Any answers? Also, it’s been a week since the Walking Liberty has been issued and except for sales numbers, I havent. Heard on word about them. I got min Wednesday and it’s beautiful. Now I have all three. Anybody else care to comment? Seth? The Eagle being released December 1 (“American Eagle 2016 One Ounce Silver Uncirculated Coin” per their website) has a lettered edge which is unlike the bullion coin released earlier that has a reeded edge. I think that this will continue to sell on into next year and here is why: the “Annual Uncirculated Dollar Coin Set 2016” will be released by the mint on December 14 and it has the lettered edge uncirculated Eagle in it as far as I know. I am pretty sure that this set also will sell into 2017. I don’t think they’d release this on the 14th and then stop selling it on the 31st. So, going by that reasoning the stand alone uncirculated Eagle should also be offered for sale in 2017. You’d think that if they were going to stop selling them that they would advertise this, but then again they often do things that doesn’t make sense. Strange, that they refer to this new set as limited. The only thing limited about it is as usual, the US Mint’s imagination. The packaging is the only thing unusual. The Quarters, Dime and Half-Dollar are in the Silver-Proof Set. The Silver Eagle is also available several ways, including with the Reagan Presidential Coin & Chronicles Set. Cost wise, it’s not a Real- Deal at all, from a Financial perspective. Why would you buy this set for $140 verses the silver proof set and the proof eagle for $30 less. Is there any difference to any of the coins. This is the 30th anniversary of the eagle, so why didn’t they make a special finish? Why would the value of this set increase in value over the years at all? We’ll then, I guess I got error coins. Both of the BU raw 2016 Eagles I got from the mint have lettered edges as do the Proofs I got. Check your Eagles evertbody! and the Silver Eagle Proof for about the same. Or the Reagan Coin & Chronicles set for $ 70.00. Once again, the US Mint seems to be more like a conventional Dealer than anything else. The Burnished Silver Eagle would have been more imaginative for the Ltd. Silver Proof Set. I wonder if ” Trump ” is behind this mindless offering from the Mint ? I’m certain he’ll push Congress to Mint His own Coin soon ! But, they’ll have to make it huge in size to encompass his massive head. About $100 over spot silver price for coins that are all available in other sets. Nothing special & the box isn’t even made of wood. Talk about overpriced! Yeah, most of the stuff the Mint churns out now are ripoffs .. recycled and repackaged .. I held my nose when I bought the RR C&C set …. they put in a standard proof ASE issued for the year without even explaining why … a short sentence on the folder would have been enough .. but noooo and the Mint wonders why its customer base is declining ? And I wonder where all of their product packaging are being made .. is it overseas? sc Mac – What place does your political rant have, here on a coin-collector’s forum? Let’s just stick to discussing coins – there are enough different opinions on this topic without going off on a tangent. I agree. I thought the same thing. Why do people have to ruin comment sections with topics that have nothing to do with the article?? Might have bought one but they again ruined another series by not having the set in 2015. Just another series that they started that has gaps. So, hard to buy (or think about buying) a series that they likely will fail to make a complete one. With the cost of the mint products, I feel better about saving the $140 on this set. Don’t get me wrong, if I did not already own the silver eagle through other options, I would have bought this. Going to pass though. Nothing special about this set ..at all. The us mint is over doing it with all this products. They should bring out real collectible coins with nice low mintages and 1 HH limits on them. I think instead of being known as the “biggest mint in the world” it would suit them better to be known as “the greediest mint in the world”. They just want the $ and don’t care about collectivity of these coins. Really sad for the hobby. When are we going to stop talking about this set? The point has been made so, let’s start talking about the Walking Liberty and the last Silver Eagle about to be released. Please! Thank ya’ll. I received my gold WLH on Friday 11/25. Beautiful coin with no problems that I could see with a 10x loop. Just wish it would have been the same size as the original WLH. I am now trying to figure out a way to make a holder for all three of gold coins. We shouldn’t stop talking or complaining about this set and here’s why: A mint employee might see all of this and realize what the public sentiment is in regards to this set and their practices in general, or, someone may bring this comment section to their attention at some point in the future. I firmly believe that comment sections had a lot to do with Samsung bringing back the SD cards in their phones because of feedback on comment sections. Similarly, perhaps the mint monitors public perception the same way. If you are tired of getting a notification on this thread I think there’s a way to unsubscribe to this particular thread at the bottom of every email. I agree but since I can’t remember seeing a positive comment and I’m sure the Mint reads this Blog they should have gotten the hint by now. But as we all know, to much red tape and they have their own adjenda. But, one can only hope. I don’t think anyone at the mint knows that this website exists. (Let alone being able to read it). As Mr.Spock would say, “A very Logical Observation”. Non Numastic humor or not. Don’t blame US mint products pricey, if we compare other countries coin products, USA is one lowest price for hobbyists. Don’t complain , be happy for our glory and beautiful coin . Great job US Mint !